A team of women in Myanmar have risked their lives to document the heroin-filled world they inhabit. 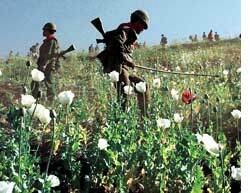 The report exposes the spreading opium fields in the north-eastern corner of the military-ruled country. Myanmar’s military regime gives the impression that poppy cultivation continues in areas only under the control of ethnic rebel groups. “This new report shows the extent of opium grown in areas under the military regime,” said Debbie Stothard, a Myanmarese human rights activist. Some 30 women from the Palaung ethnic community, who live close to Myanmar’s border with China, were involved in the report that took two years to produce, said Lway Aye Nang, its co-author. These women, who work in the tea plantations, are verbally and physically abused when their husbands need money for a heroin fix. Between 2007 and 2009, they conducted field surveys in Namkham and Mantong townships in northeastern Burma and found the area of opium cultivated increased almost fivefold: from 963 hectares in the 2006-07 season to 4,545 hectares in the 2008-09 season.